Are you sailing on the new Anthem of the Seas, or another Royal Caribbean or Celebrity Cruise ship leaving from the New Jersey area and looking for hotels near Cape Liberty cruise port? Then, you have come to the right place. Cruisers know that no matter where your cruise ship departs from, it is always a good idea to book a pre-cruise or post-cruise hotel stay to ensure that your trip goes smoothly. Living in the northeast region of the United States, we have learned to anticipate potential weather-related travel delays, so we almost always book a pre-cruise hotel. Sailing on both Quantum of the Seas in 2015 and Anthem of the Seas in 2016 out of Bayonne, NJ, we only had a four hour drive from home. Thus, a pre-cruise stay in a hotel was not necessary, but we decided to book a hotel near Cape Liberty cruise port anyway. 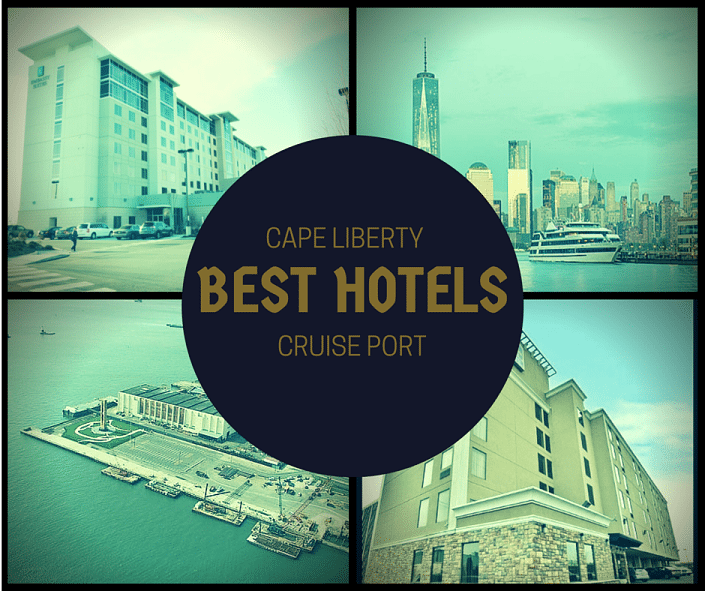 We spent hours researching what hotels near Cape Liberty cruise port would be the right fit for us. Our readers can now benefit from our time spent searching, comparing, and cataloging the best hotels near Cape Liberty Cruise Port. Now, you have all of the ammo you need to pick the hotel that is perfect for your family’s needs whether you are planning a pre-cruise or post-cruise stay in the area. To compare prices for hotels near Cape Liberty cruise port, we used prices quoted on each hotel’s website. We tested the same night, for two adults, in a standard king bedroom. We picked a pre-cruise stay six months prior to our sailing and checked prices directly though the hotel’s website. Of course, hotel prices are subject to change. Depending on the dates and length of your stay, prices quoted below may be different. There is no guarantee you will get these rates, and the prices shown below are for illustrative purposes only. Hotels may also choose to discontinue certain promotions at any time, so be sure to contact the hotels first before booking to learn about any restrictions. Perfect for travelers looking to get a great deal, but not wanting to sacrifice features and amenities. This hotel seems to be a favorite among many of the cruisers who have traveled from Cape Liberty Cruise Port. Located at the Newark Airport, it is a good location for travelers who will be arriving to the area from outside of the Northeast region. The Best Western Hotel rate includes free WiFi, and the hotel is home to a full service restaurant that serves lunch and dinner until 11pm. This AAA rated 3 Diamond hotel contains rooms with a contemporary design, including a separate desk area, love seat, and other in-room features like a mini-fridge, microwave, and a coffee maker. With close to 865 reviews on TripAdvisor, the hotel gets a rating of 3.5, with most travelers liking the convenience and service of the hotel, as well as the complimentary breakfast. Note, this hotel is at the airport, although many report that noise is not an issue. You may not worry about the location when you hear that the price was $129.99 (pre-tax) for our test one night stay. This rate includes round-trip shuttle to and from the cruise terminal. Recently, the hotel eliminated parking as part of this package, so that will cost you extra. 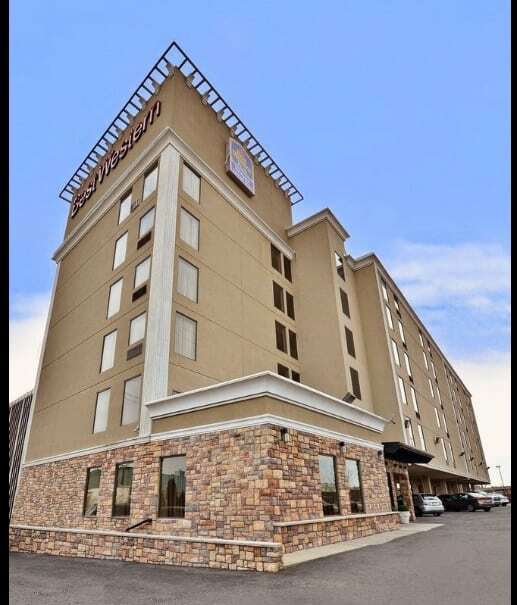 With a complimentary warm breakfast, a shuttle to and from the cruise port, and transportation to and from Newark Airport (if needed), this Best Western may be one of the best deals for hotels near Cape Liberty Cruise port. This hotel is perfect for travelers who want everything covered with one simple reservation. 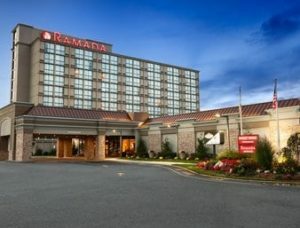 Also located at the airport, the Ramada Plaza has recently received some updates and refurbishment. Along with the improvements is a 24 hour café with snacks available, a full service restaurant (the Hunt Room) serving food all day, as well as a sports pub/restaurant (Teddy’s Bar and Grill). This hotel also offers 24 hour airport shuttle service. Rooms come standard with a separate desk and free WiFi internet access, as well as a sitting area, mini-fridge, and microwave. The bathrooms have also been upgraded to include tiled showers. With more than 680 ratings on TripAdvisor, this hotel has an overall rating of 3.5, but with more variability in respondents’ ratings. Newer posts indicate that the renovations have been a big improvement in their experiences at the Ramada Plaza. What is not so average is the crazy Cruise, Stay, and Park promotion that is offered. For some reason, this package is only available through a third party company, Trinity Reservations. On the Ramada’s website the only similar package you can purchase is a Fly and Stay option. For our test night, the cruise and stay package came to $202 (including tax) for two travelers with transportation to and from the cruise terminal and parking for up to 21 days. One of the best package deals we found for hotels near Cape Liberty Cruise port! This hotel is perfect for travelers looking to avoid the crowds (and the airport), but still wanting access to plenty of food, shopping, and fun. About 3 miles south of the airport is the Embassy Suites Elizabeth, NJ. The Princess and I stayed at this hotel last year prior to our Quantum of the Seas trip. 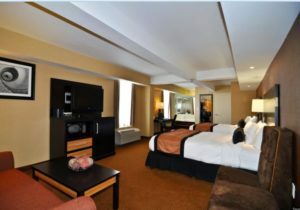 Get a more detailed review of the hotel, amenities, and restaurant in our complete hotel review of the Embassy Suites, Elizabeth, NJ. This hotel hosts full service amenities including a fitness area with a heated indoor pool and business center. It also offers a free hot breakfast buffet for travelers. With large suite accommodations, including a separate sitting area with television, bedroom, and bathroom with an over-sized shower, you can get your vacation started on the right foot. 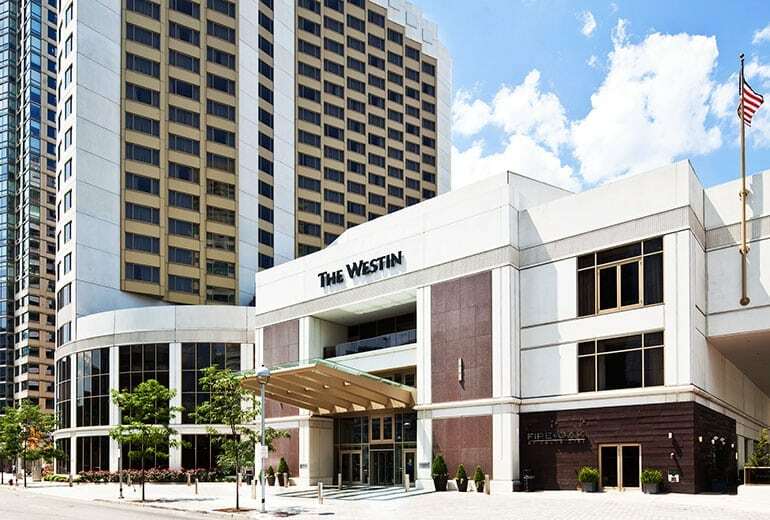 With a bright and open lobby to welcome guests, the over 500 travelers on TripAdvisor give this hotel a 4 star rating, citing the location to transit into the city and the mall among some of the hotel’s appeals. 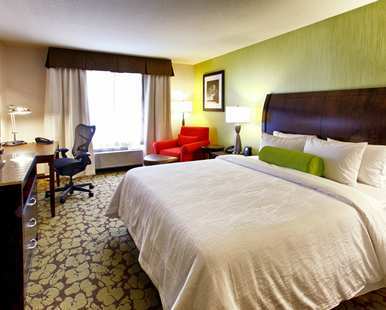 For our test night, the Park, Ride, Cruise package for two adults was quoted as $289 (pre-tax) for a king bed. This package includes round-trip transportation to and from the pier and parking “for the duration of the cruise”. Another nice perk is the nightly reception with complimentary snacks and a great happy hour to help get you in the cruise mood. 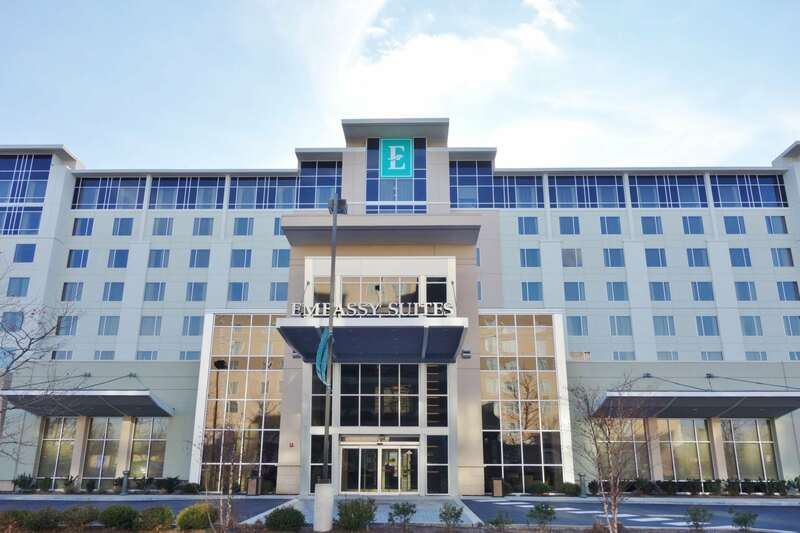 Located across the street from one of the largest outlet retailers, the Embassy Suites is a good option for Hilton HHonors members looking for hotels near the Cape Liberty Cruise Port. 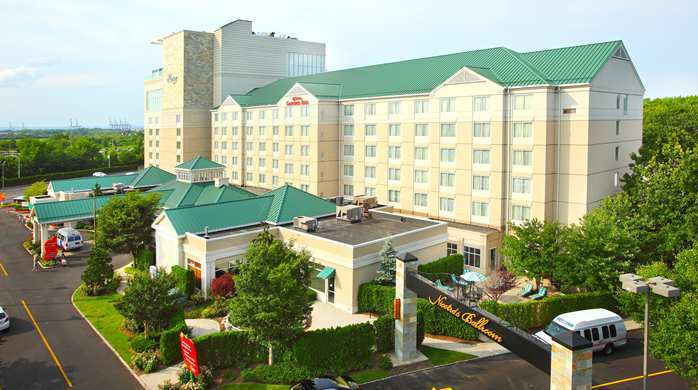 This hotel is located in a small plaza with other hotels, including Country Inn and Suites in Elizabeth, NJ, Residence Inn , Elizabeth NJ, and Courtyard Marriott, Elizabeth, NJ. A review of those hotels reveals they offer similar accommodations in the same price range. This hotel is perfect for travelers who want to be closer to the city, but do not want to pay NYC prices. If you are looking for a hotel a bit closer to New York City, then you may consider staying in Staten Island, NY. 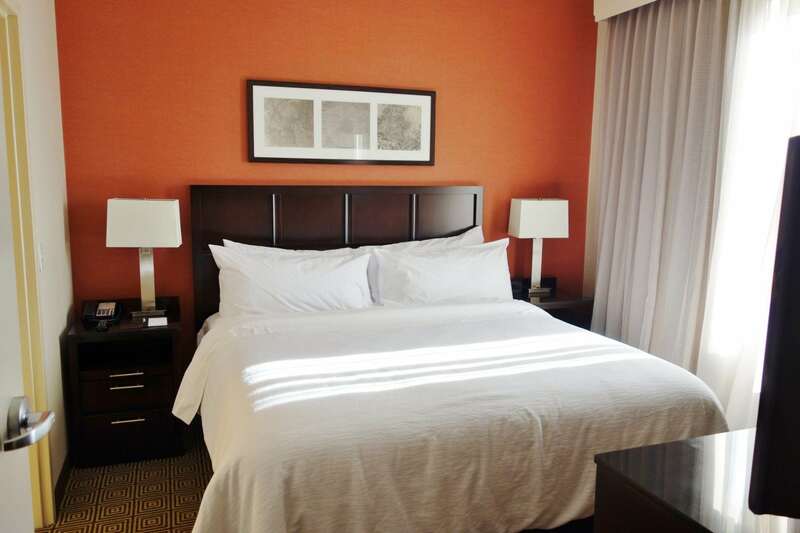 Adding only a few more minutes to your trip to the port, the Hilton Garden Inn might be worth the extra drive. This hotel has an upbeat and welcoming lobby, a fitness room, and a lovely outdoor patio and garden area, which includes a pool. Twenty-four hour snacks are available, and Lorenzo’s Restaurant offers breakfast, lunch, and dinner. Those with Hilton HHonors points may consider this hotel when traveling from Cape Liberty Cruise Port. With over 800 reviews, TripAdvisor travelers give this hotel a solid 4.0, and it was awarded the site’s Certificate of Excellence in 2014. With a variety of different room types to choose from, we compared the rate for a standard King bed. The room comes complete with everything you would need including free WiFi, plenty of space, and even a Keurig Coffeemaker for that early morning departure! Booking this room as part of the hotel’s Park, Stay, Cruise package came to $211.00( pre-tax). This package includes round-trip transportation to and from the port (which needs to be reserved at set times) and complimentary parking on site for the length of your cruise. The Hilton Garden Inn in Staten Island might be one of the best hotels near Cape Liberty Cruise Port for those who want to hop on the Staten Island ferry and head into NYC for the day. Just North of Cape Liberty is the Westin Jersey City Newport. This modern hotel offers first class accommodations at reasonable prices. With amenities like the WestinWORKOUT® Fitness Studio with a heated indoor pool and in-room spa treatments, this hotel is the perfect way to start (or end) your cruise vacation. With fresh, modern decor and impressive rooms throughout the hotel, it is no wonder that the 1,200 reviewers on Tripadvisor give this hotel a 4.5 rating. For our test night, the luxurious king bed room came in at $197, a bargain considering these rooms offer plenty of upgrades like the Starbucks-filled coffee makers. Offering plenty of space to get some last minute work done or to just relax, these rooms feature the brand’s Heavenly Bedding and Bath collection leaving you well rested and recharged to start your vacation off right. For dining, enjoy a drink at the Half Moon lounge or dinner at the Fire and Oak offering upscale American grill dishes. Internet is free for Starwood members who book through the hotel’s website or is $9.99 additional. Parking is not included and costs $22 for self-parking (add another $10 for valet). Transportation to and from the airport and cruise terminal are not included. 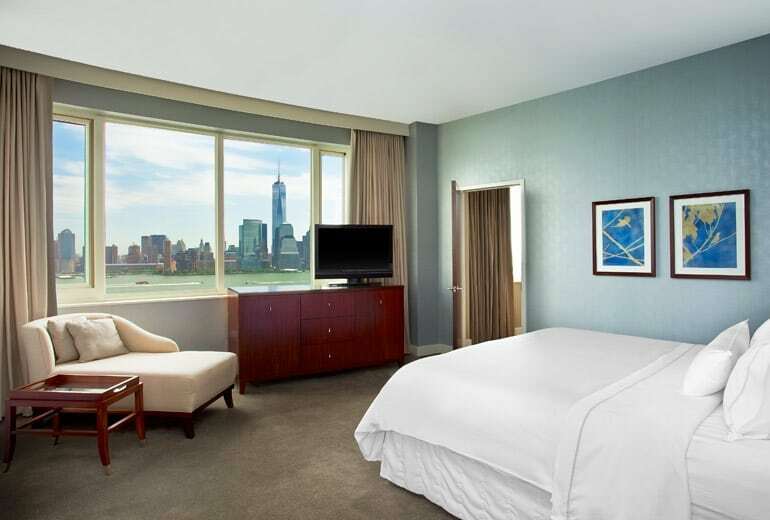 The hotel is also conveniently located near Liberty State Park, which offers a picturesque Riverwalk and ferry service to the Statue of Liberty and Ellis Island. This hotel is perfect for travelers who want to spoil themselves while on vacation. 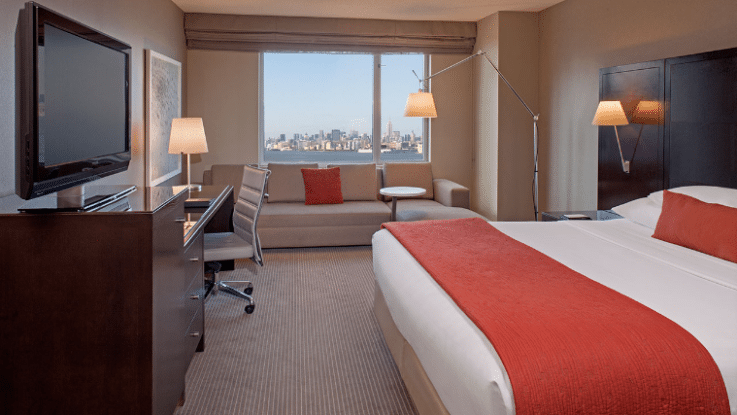 There is easy access to NYC by either the ferry or PATH transit, all within a short walking distance from the hotel. Given the amenities, who would want to leave? OK, maybe for a cruise! Adults can enjoy drinks and tapas at the lounge or opt for a full dinner at the hotel’s restaurant Vu, which offers panoramic views of Jersey City and Manhattan. Don’t worry, babysitting is available (for a fee) if you are looking for a quiet dinner for two. These features do come at a price, but a very reasonable one given the location and amenities. For our one night pre-cruise stay, the advanced purchase price (meaning no cancellation) was $279 (pre-tax) for a king room. 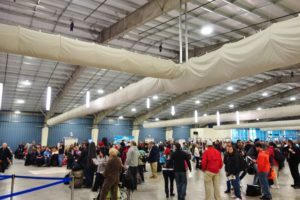 The daily charge for parking ($38), transportation to and from the airport, and transportation to and from the cruise terminal are all additional costs. 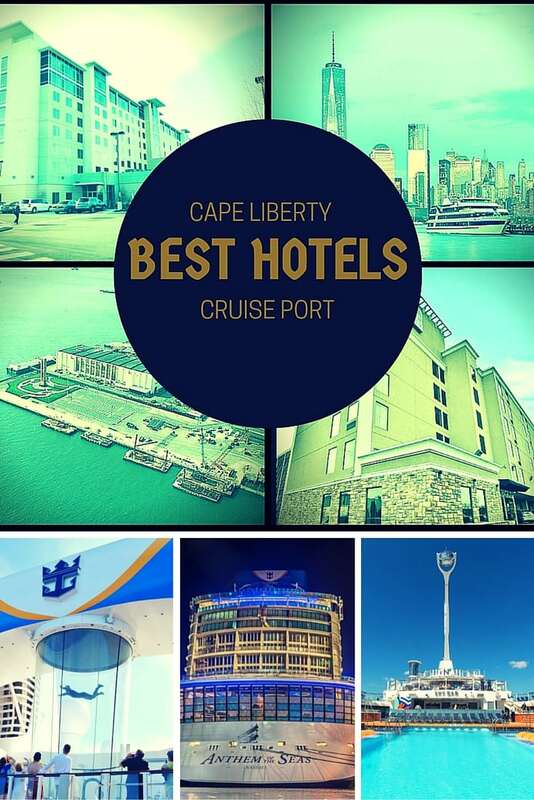 Have you stayed at any of the hotels near Cape Liberty Cruise Port? Do you have a recommendation or caution regarding any of the hotels listed? Drop us an anchor below to let us know about your pre-cruise or post-cruise hotel experiences when sailing out of the New Jersey area. Help your fellow travelers find the perfect accommodations for their vacation! This is such helpful information! Thank you! I just called the Best Western and they no longer offer the 10night free parking. It is $8/day to park with them. Bummer! Thanks Kate for the information. Appreciate you sharing that with us. We are planning on updating the post soon, so this came in very handy. When do you sail on your next cruise? Thank you for positing this. I was just starting to sift through all the hotel reviews, and I stumbled on this article. You saved me much time at the Keyboard. This is particularly challenging for me, as I come out of the Boston area and for years, there has been bus service from several New England cities, right to the pier. Just recently, the bus company terminated it’s arrangement with the cruise lines so I need to find alternatives. Like many others, I don’t like the idea of trying to come down on the morning of the cruise; too many things could go wrong: flights canceled or delayed, same with Amtrak, breakdown with your own vehicle. I think it’s safest to come in the day before. I was really pleased to see that you included some options with close proximity to NYC; always fun to spend time in the city! It was very nice of you to put this together. Hi Sherry. Sorry for not responding sooner. Glad you found our post helpful. We are in the midst of updating some of the information as a few hotels have changed their promotions! Good news is we have seen costs come down a bit. We tried to cover a bunch of different hotel options for travelers with different tastes and preferences. Love to hear where you end up staying and if the hotel might your expectations. When do you sail out of Cape Liberty? Hi, thank you, will look forward to the new info. My t/a got me into the BW for $175, which includes full breakfast, transport to/from pier, and shuttle to/from airport if needed (or in my case, the train station at EWR). Looks like we will be on the same cruise! We are sailing on Anthem on April 30th as well. It should be a great trip. Hi…great info. I have made a note of the hotels, as my husband and I will be sailing on the Anthem of the seas in April 2017. Does anyone know if there is any hotels in new jersey,that do the shuttle to the Manhatten pier? We have booked a family cruise for Dec from Manhatten pier! Thanks! How Much Are Alaskan Cruises?